The ingenious Refgas technology converts waste wood and some other waste materials into a synthetic gas that is cleaner than natural gas ! From there, the gas is used to fuel standard engines and generate power and heat, with each compact unit being capable of generating enough power to service a couple of thousand homes. Neil Richards, CSG’s managing director stated “Our whole philosophy is to recover or recycle waste materials wherever possible and avoid landfill disposal “. 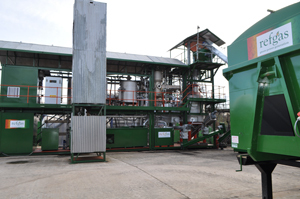 “The Refgas team has taken this one step further, using waste materials to generate power, on an impressive scale, with an incredibly clean, compact and efficient process”, he continued. “We are certainly not alone in considering alternative energy solutions which are green, sustainable and able to save us a lot of money, now and in the future”, concluded the CSG managing director.